A.R.M.S., Inc. A.R.M.S. 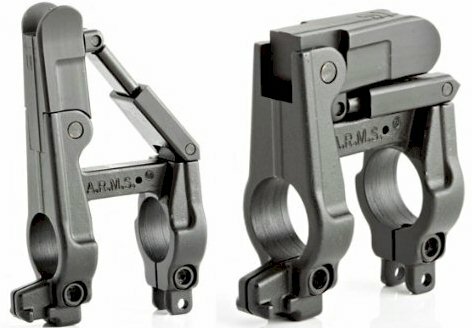 Silhouette Folding Front Sight Gas Block + Bayonet Lug The A.R.M.S. #41-B SILHOUETTE Front Folding Sight with Bayonet Lug solves the problem of trying to fold the well known triangle shape of the conventional non folding front sights. Barrel mounted in place. Utilizes a rugged spring loaded angled support system to eliminate getting caught up in brush and other combat hazards. Also uses the standard front sight post. This new sight, A.R.M.S. SILHOUETTE, has the shape we all know and love, but it also folds and deploys using only a finger of one hand. It's extra rugged via the support angle, plus all the other features of the great conventional non folder, it also uses the standard front sight bead, and or night sight posts. It is barrel mounted into place, via the included allen wrench. 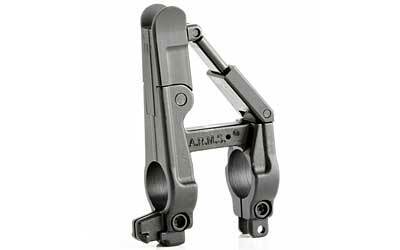 A.R.M.S.® "SILHOUETTE™" #41-B™ Folding Front Sight, Patent's Pending. Fits Standard size (.750") barrel. The A.R.M.S. #41-B SILHOUETTE Front Folding Sight with Bayonet Lug solves the problem of trying to fold the well known triangle shape of the conventional non folding front sights. Barrel mounted in place. Utilizes a rugged spring loaded angled support system to eliminate getting caught up in brush and other combat hazards. Also uses the standard front sight post.